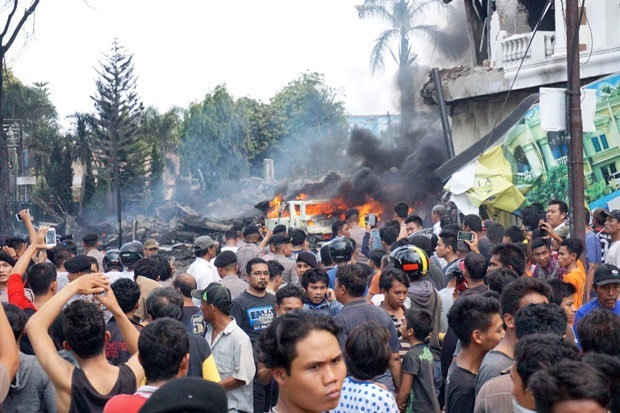 AT LEAST 74 people have been killed after a military plane – with more than 100 people on board – crashed into houses in a highly populated area of Indonesia. Smoke could be seen billowing into the sky as rescue workers raced to the scene. Dramatic photos show how the plane obliterated houses in a residential area in the Indonesian city of Medan. Officials say at least 74 have been killed in the crash. The Hercules C-130 jet crashed into two houses and a car, crumpled a car which burst into flames and shattered a building which housed a spa, according to local TV stations. Thousands of onlookers soon gathered near the scene of the wreckage. Adam Malik hospital spokeswoman Sairi M. Saragih said the hospital had taken in 20 bodies so far. Two people who lived where the crash happened are critically injured. The crash of the transport plane occurred just two minutes after it took off from Soewondo air force base. Air force chief Air Marshall Agus Supriatna said the pilot told the control tower that the plane needed to turn back because of engine trouble. “The plane crashed while it was turning right to return to the airport,” Supriatna said. There were 17 military personnel on the plane, he said. Medan resident Fahmi Sembiring said he saw the gray Hercules flying very low as he was driving. “Flames and black smoke were coming from the plane in the air,” he said.